Ever since I can remember I’ve wanted to travel the world. I couldn’t tell you where the desire came from or when it started, but that longing would have me staring at photos of foreign places everyday. When I was in my junior year of college, I made it my mission to study abroad somewhere that I would love and have the opportunity to travel almost every weekend. I quickly found myself set up to study in London for the spring semester with classes only two days a week, meaning an open schedule for exploring Europe. In those four months I traveled to nine different countries and I still have many more to hit. 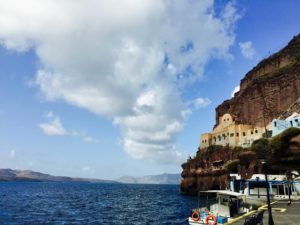 It’s been awhile since I spent my days traveling carefree on another continent, so I wanted to utilize these blog posts as a way to spotlight some of my travels (and maybe relive them myself). We’re starting off this week with my dream destination, Santorini Greece. 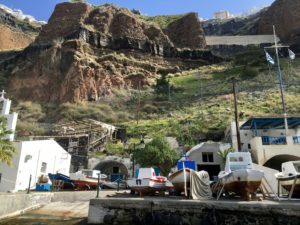 I stumbled upon a photo of the beautiful and picture-perfect village of Oia a couple years before actually getting the chance to see it with my own eyes. After that moment I knew 110% that I was going to find myself standing and taking that same photo no matter what it took. **If you’ve seen Sisterhood of the Traveling Pants, this is the location where they actually filmed when Lena went to go visit her Grandparents!! 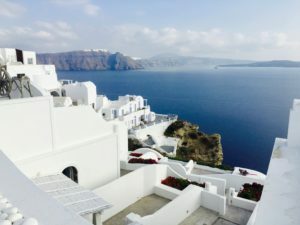 Spring break rolled around and a group of friends and I planned Santorini as our first stop of the week. 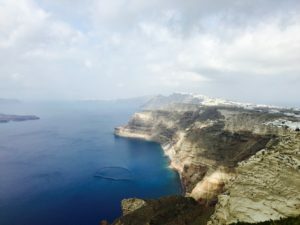 We took a flight from London to Athens (the longest flight I took traveling from London at around fours hours) and then took another short flight (around 45 minutes) to Santorini and the smallest airport I’ve ever seen. We didn’t stay in Oia or some four star resort because well, broke college students. But the hotel we stayed at for three nights had a car and a tour guide that drove us all over the island to the must-see spots. 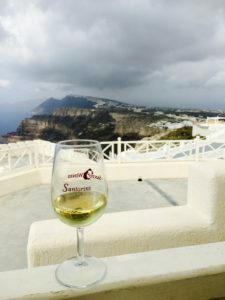 We were taken to Santo Wines Winery which has breathtaking views and delicious (also interesting) wine tastings. 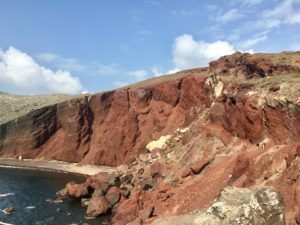 Next up, one of the most famous and beautiful beaches in Santorini, the “Red Beach” located near the village of Akrotiri. 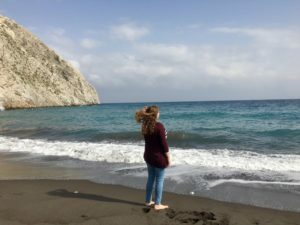 The “black beach” or as it’s actually called, Perissa/Perivolos Beach. Here’s an awesome photo of a hair-flip in action. Here’s just like 1% of the photos I took of the village of Oia because it was so beautiful I can’t even describe what it was like to watch the sunset there. 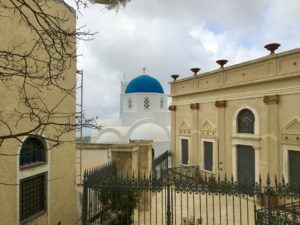 When you enter the main square of Oia, turn right and walk as far as you can. You’ll eventually stumble upon a seating area where you can go and watch the most amazing sunset you’ll ever see. 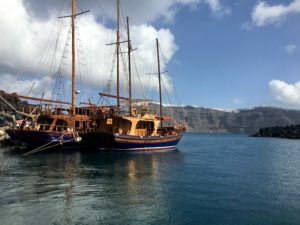 The next day we headed down to the docks to get on a boat where we then traveled to hike an active volcano and jump into a hot spring. So here’s just some of the photos that I took of my dream destination. I can’t even fathom that I was lucky enough to get the chance to see this beautiful country. 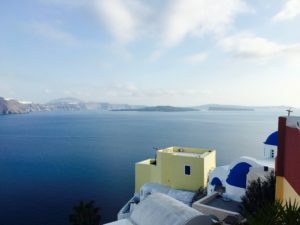 I would wholeheartedly recommend that everyone travel to Santorini in their lifetime. The country of Greece is so warm and welcoming, I know I’ll be going back. Many photos from my travels are displayed in the gallery section of this website. Go and take a look. Let me know what other countries you want to read about/want to see more photos of!